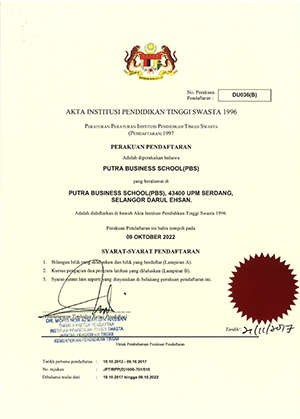 Putra Business School (PBS) is today an autonomous private business school located in Universiti Putra Malaysia (UPM). PBS was renamed from UPM Graduate School of Management (GSM) at the Lembaga Pengarah UPM (LPU) (the UPM Board of directors) meeting on 6 July 2011 in response to a Cabinet Memorandum (Memorandum Jemaah Menteri dated 24 October 2007) to elevate the status of business schools in Malaysia. PBS is privileged to be identified by the Ministry of Higher Education as one of the “top business schools” in Malaysia for this purpose. A private foundation, Yayasan Putra Business School, was created to allow PBS to exist as a private university. Yayasan Putra Business School (Co.Reg.958242) was formed on 23 August 2011 as a not-for-profit company limited by guarantee (a foundation) with its own Memorandum and Articles of Association for the sole purpose of bringing into existence and managing the PBS. No other activity is permitted in Act 555. The Minister of Higher Education invited YPBS to establish PBS in 19 December 2011 and its education licence for operation was issued on 9 October 2012. “5. The primary object for which the University is established is to provide higher education with a view to nurture human leaders who subscribe to human governance as embodied in whole persons and take any action incidental thereto in accordance with all provisions of the Act and this Constitution”. With this arrangement, Putra Business School (PBS) as an autonomous institution of higher learning in Malaysia (Institusi Pengajian Tinggi Swasta, IPTS) came into being with a clear mandate. Also with this arrangement, PBS cannot operate on its own and is accountable to the Yayasan Putra Business School which in turn has to follow the law of the land as dictated by Companies Act 1965. PBS operating within the structure of YPBS is thus an autonomous university as defined by the Private Higher Education Institution Act 1996 (Act 555), with Yayasan Putra Business School as the holding company of PBS. A Memorandum of Agreement was signed on 31 Dec 2012 between UPM and YPBS whereby UPM grants to YPBS the licence to offer and conduct the post graduate programmes to the standard established by UPM (MBA, MM (IT), MSc, PhD) and to use UPM facilities.